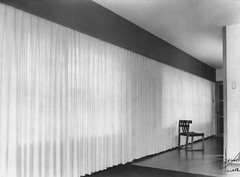 When the continuous curtains are closed, it unifies the entire north wall of the house, allowing filtered light to enter. The light colored fabric helps to create a sense of spaciousness, continuity, and openness connecting the Dining and Living Rooms. Armstrong's dark Shanley Chair made from wood with fabric tape is silhouetted against the simple white drapery. The dark painted valance overhead acts as a foil to the bright curtains.